Do you have a passion for golf you would like to share with others in a caddy position? Since this position is customer facing and an extension of the golf course, it important you articulate your knowledge, experience, passion, and professionalism in your cover letter. Include examples of your previous golf and customer service experience and any athletic recognition you've received. Leave the hiring manager confident in your ability to provide top-notch advice and customer service to their clientele. Below is a sample summer golf caddy cover letter for you to use as a guide. Also, review a golf caddy resume example. I would like to express my strong interest in the golf caddy position you listed on golfjobs.com. You state that you require someone with knowledge of the sport and experience in customer service. I have extensive experience in both of these areas and know that I would be an ideal candidate for the position. I have been playing golf for the past 10 years. I am currently team captain for my high school golf team, and have achieved numerous successes on the team; I have placed in the top five for my district the past three years, and have performed at a number of national championships. I also have experience coaching others in golf; I run a clinic for young golfers and assist my teammates who are struggling with particular skills. As a caddy, I would be extremely comfortable on the course and would be able to answer any of the club members’ golf-related questions. I also have extensive customer service experience. As a waiter, I interact with a variety of people of all ages and backgrounds. When a customer is upset about an aspect of his dining experience, I am always there to assist him with a smile on my face. As a cashier, I even received multiple Employee-of-the-Month awards for my excellent customer service. I know that this experience will allow me to provide a friendly and enjoyable experience for all club members. I am confident that my golf knowledge and customer service abilities would make me an excellent golf caddy for the East Longmeadow Golf Club. I have enclosed my resume to provide you with further details on my experience. Thank you so much for your time and consideration. 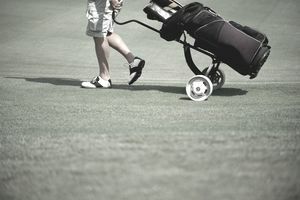 Because this is high school student’s resume (and the student, therefore, has limited work experience), the resume includes all work experience, even work not directly related to being a caddy. The resume also includes extracurricular activities. Download the golf caddy resume template (compatible with Google Docs and Word Online) or see below for more examples. Experienced and accomplished golfer seeks an opportunity to work as a caddy. ● Red Cross First Aid, CPR, and AED certifications. ELEMENTARY GOLF CLINIC, Hampden, Mass. ▪ Assist in coaching monthly clinic for middle school golf enthusiasts. ▪ Provide instruction on basic skills, including swing skills and putting tips. ▪ Design golf tournaments for players at the end of each season. ▪ Greet customers and provide details on daily specials. ▪ Confirm customer satisfaction during each meal. ▪ Thoroughly answer questions regarding preparation and ingredients for menu items. BIG CITY GROCERY STORE, Hampden, Mass. ▪ Greeted incoming patrons, offering assistance with locating items and using coupons. ▪ Managed cash register, handling debit, credit, check, and cash transactions. ▪ Honored as Employee of the Month three times for exceptional customer service. Review more professionally written resume examples for jobs, internships, gigs, volunteering, and other positions.